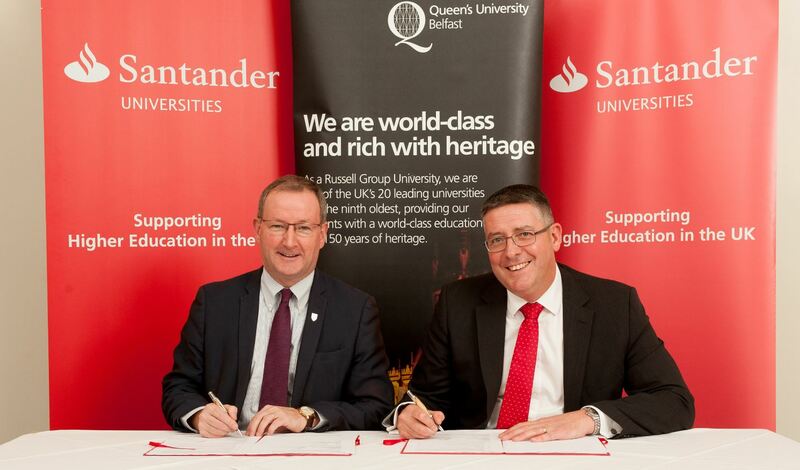 Queen’s has renewed an agreement with Santander Universities UK which will see the Bank continue to fund mobility awards and scholarships, support employability and skills through internships, foster entrepreneurship and support other initiatives, until 2020. The special signing by the University’s Vice-Chancellor, Professor Patrick Johnston (above left) and Matt Hutnell (right), Director Santander Universities UK), took place on Monday 12 December in the Old Staff Common Room at Queen’s. Present for the occasion were Professor David Jones who chairs the Santander Working Group at Queen’s, a number of Santander scholars and interns, along with two participants in the Santander internship programme – Joanne Casey (MD) from Glowmetrics and Una McKernan (Deputy CEO) from NICVA, the NI Council for Voluntary Action. Queen’s became a Santander University in May 2008 with the signing of a 3-year partnership agreement and since then the relationship has evolved, with Santander supporting many initiatives throughout the University. To date Queen’s has received over £1m in philanthropic funding from the Bank, which has a branch in the Students’ Union at the University. Speaking at the signing, Professor Johnston said: “This strategic partnership has created opportunities for both staff and students at Queen’s to participate in a range of activities, and encourages exchange and interaction between us and universities in the Santander Universities Network. The Santander funding supports scholarships and mobility awards for students and staff, entrepreneurship activities, internship funding as well as leadership and skills development for students. In addition, new initiatives are brought forward each year which regularly attract support. Matt Hutnell welcomed the extension of the agreement, saying that Santander Universities UK viewed Queen’s as a leader in the initiative, particularly in how the University worked closely with community, voluntary and public sector bodies and made best use of the resources available for internship funding. In closing, Professor Johnston said: “At a time when education funding is both inadequate and under further threat, the partnership with Santander is even more important than ever. For more on the Santander SME Internship Programme visit the Careers website; for details of the work placement scheme within Santander please contact Colm Quinn. General information on the University’s relationship with Santander is available from Jacqui McCormick. Media inquiries to Gerry Power, Communications Officer, Development and Alumni Relations Office; tel: +44 (0)28 9097 5321.